The Los Angeles Fire Department doesn’t just wait for disaster to happen. They are proactive in preventing both fires and safety hazards. While Venice may not be in a densely vegetated hillside or prone to heavy flooding, the firefighters at Station #63 inspect between 900 and 1000 buildings annually to check for fire regulation violations and any source of potential danger. “We document the inspections,” says Captain Vilaubi. “Fire prevention is not just for us. It’s for the occupants to make sure they are safe.” Also, upon request, the firefighters will go out into the community, whether a personal residence or function, to provide information on fire prevention systems. Station #63 is a task force station – with a truck, engine and pump. The truck, driven by the AO (Apparatus Operator), carries the ladders and other equipment. The Captain II is in charge of an operation. The front engine, driven by the Captain I, carries the water and the rear engine, driven by an Engineer, is known as the “pump” and it provides additional water. “Our whole emphasis when we are in or outside of quarters is to respond within one minute,” says Captain Vilaubi. Precision teamwork is probably no more evident than in the fire department. Firefighters learn to train as if their lives depend on it and this serves them, and us, well. Firefighters have specific jobs depending on where they sit. On the engine, the hydrant person lays the hose line to supply the water and then helps fight the fire, the Engineer pumps the water, the nozzle person fights the fire and the Captain I is there for back up. The Captain II sizes up the incident when the truck comes on a scene. The AO’s main job is to ventilate the roof. The tillerman, driving the rear, is responsible for shutting off the utilities. This insures that the firefighters won’t get electrocuted plus it prevents the fire from being force fed. The top position on the truck assists with the ventilation. The inside person assists with entry. If the building is closed, he’ll get the rotary saw, which opens everything, to provide access. Once inside, he’ll pull ceilings or maybe do a search and rescue. The other truck people go on top of the roof let the hot gas, smoke and fire out. Firefighters know a little about a lot. They need to know about electricity. Wires falling in the rain and wind can be dangerous. They need to know about car construction to understand how a car is put together because they will take them apart. They can’t fight against what has been designed to be the strongest points. It’s just as important to know the weakest points because that way the doors and roof will come off easier. The same with building construction. They want to stay away from weak points and know what’s going to burn the fastest and come down first. It’s important to know roof construction to be aware of where they are walking. Venice is not a cookie cutter community. It is important to predetermine good access points. Venice streets can be tricky. Some are pie shape and they change direction. Abbot Kinney Boulevard is called a “dogleg” street – meaning, in firefighter lingo, that it doesn’t follow a north/west or east/west direction. In addition, normally when you travel in a northerly direction the numbers on the east side are even and the west side odd. The addresses on Abbot Kinney are the opposite. Numerous one-way streets have to be anticipated. Homes on the Canals and walk streets can only be accessed from an alley. It is important for these buildings to have to have address numbers facing the courts. Venice is a beach community with a lot of traffic on weekends. Our fire department needs to have predetermined routes in order to avoid this congestion. According to Captain Mark Wolf, in charge of statistics for the LAFD Planning Section, Station #63 had 1075 incidents during the last quarter of 2009 – 46% for advanced life support and 33% for basic life support for a total of 79% EMS (Emergency Medical Service) and 21% for fire and other. Overall City of Los Angeles figures for the same time period were 82% EMS and 18% fire and other. Out of a total of Station 63’s 1618 responses, 42% were made by rescue (ambulance), 31% were made by light task force (truck and engine) and 27% by engine. Prior to 1970, the ambulance service was handled by the Health Department that, at the time, was part of the City of Los Angeles. The Metropolitan/Downtown area had 13 ambulances running out of different facilities including police stations. The service on the Westside was contracted out to private companies. The Valley fire stations had their own ambulances. The Harbor area used some ambulances that were in stations and others that were private. In 1970, the mayor and city council agreed they didn’t like the way the system was managed. It was decided to give the ambulance service to the fire department because it relates – firefighters save lives, ambulances save lives. Thus, was born the paramedic whose purpose is to provide advanced life support in emergency settings. 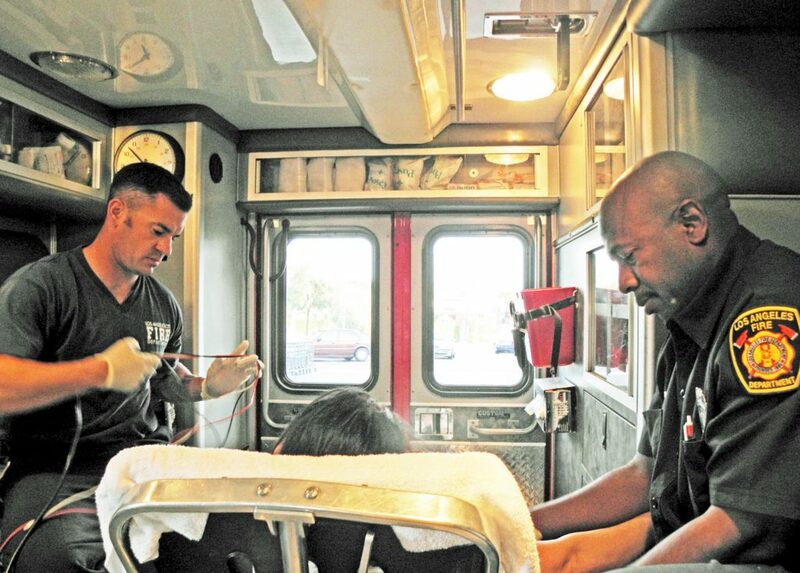 You may wonder why you see a fire engine with an ambulance at a medical emergency. There is no fire. Quite often an engine is able to reach the scene first. All firefighters are trained to give basic life support. If someone is critical, they can keep them stable until the arrival of a paramedic, who gives a higher level of medical care. That can mean the difference between life and death. Also, there are situations, and I witnessed one myself, where the patient needs both paramedics to perform the life saving tasks. One of the firefighters can then take over the driving duties. I have to say I was impressed with our life savers. They are dedicated, knowledgeable and enthusiastic about their job and proud to be firefighters. Hopefully we won’t need their services, but if we do, we’re in good hands.